Yea Right! That’s what they all say. 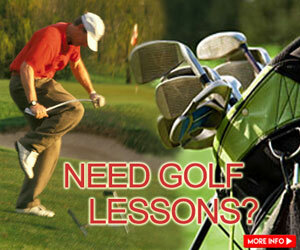 When it comes to golf training aids, I am usually a bit skeptic. I’ve had my fair share of supposed game changing training aids that have pretty much made it to the back of my closet. That is why, when we were offered the chance to do a product review on the Powerchute Swing Trainer, I was a bit hesitant. We’re normally pretty picky when it comes to reviewing training aids so we had to do our research. The first thing I did was go online and watched the youtube video that was on their website. You know, the one that has Jack Nicklaus gaining an increased swing speed of 5 1/2 mph in 5 minutes. Sounds like a gimmick right. However, I figured that if Jack, Jason Zuback (world long drive champ), and PGA Pro Jim Sowerwine were willing to put their face and names on the line for this flappy piece of tarp, then I figured it’s worth a shot. So I agreed to do the product review. Just to give a full disclosure, we were sent a free sample of the Powerchute. However, this review is unbiased and is based off of my personal experience using the club firsthand. Here is what the product claims. 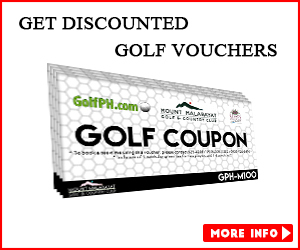 “If you’re looking to increase your swing speed and driving distance, we know of a training aid just perfect for you! Before I get into the results of the test, I feel as if it’s important for me to give you a little bit of background on how I usually hit my drives. The driver is actually the weakest part of my game. Even though I am a big guy, my average distance usually falls within the range of 210 yards with a bit of a slice. According to my pro, I use too much arms and not enough back to give me the right power that I need to launch it. Also, I tend to release the club a bit too early before my hands can even pass my hips resulting in a major power loss during impact. From reading the description of the product, there were 2 things that I was hoping to improve on. Note: Even though the Powerchute promotes an increased swing speed, it wasn’t really my main focus and I didn’t really put too much emphasis on testing it. The product came in a small box. A very simple piece of equipment with a flag and 2 clips. The flag acts like a parachute, providing resistance every time you swing. I followed the simple instructions and was able to snap it on with ease. The whole process took about 2 minutes to figure out. After getting one of my spare drivers setup, I stepped right outside my office and gave it a few swings. I did what everyone else did on the video, which was take a few swings with the Powerchute, then took a swing with my driver. Like everyone else, I almost fell off balance and probably increased my swing speed by 5 mph in the process. That would be great, but increasing swing speed wasn’t my main objective. Plus, I’ve achieved similar swing speed results in the past using other tools such as the swing fan and the momentus weighted driver. What I wanted was more lag on my swing and I wanted to be able to turn my body more instead of relying so much on my arms. The biggest difference between the powerchute and the swing fan is that instead of just swinging mindlessly, you are going through the swing sequence at slow motion enabling you to picture what you actually want to do. How I Did The Test. So because I knew that I was writing this review, I felt like I needed to give this piece of equipment a fair shot. I didn’t want to judge it off a few swings. At the same time… I didn’t want to spend an unrealistic number of hours on the range. 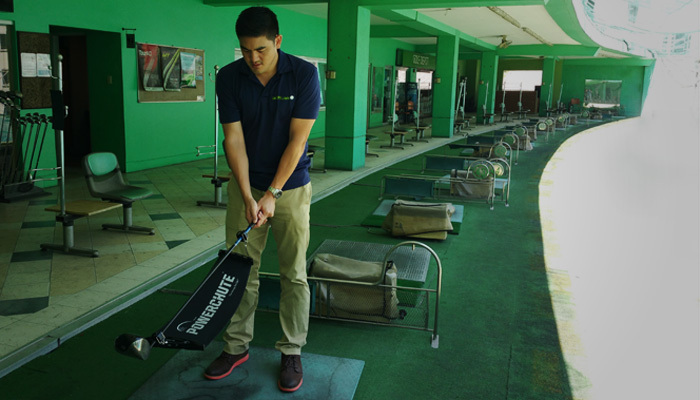 For this review, I decided that I would create a simple practice plan, concentrate on my lag and body rotation and stick with it. The plan was to take 15 swings a day during my office break, 4 days a week, in 2 weeks for a total of 120 swings. Just enough swings for me to be able to form a general opinion on the product. Also, with each swing, I made sure to focus on the lag, and properly turn my shoulders and back. The Results – Gimmick or Game Changer. First of all, these results are based off of my experience. I didn’t have a trackman. I didn’t have a pro on hand and I didn’t have any scientific data to back up my results. Everything that I am writing about is based off of my opinion from using this training tool sparingly in 2 weeks. After the 2 weeks was up, I was ready to put my drives to a real test. I hit up my buddies and played 2 rounds of golf with my usual group. 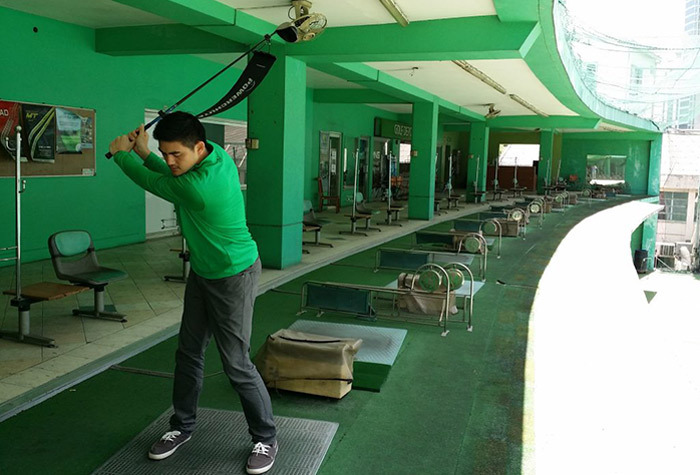 The first was at Sherwood Hills Golf and Country Club and the 2nd was at FA Korea in Clark. Based off of my experience, 3 things happened. My friends think it was luck. I think it’s because I practiced everyday. Who knows… maybe the Powerchute really did give me straighter drives and more accuracy. This wasn’t because I increased my swing speed. I think it’s because of the conscious effort that I made to turn my body more on drives. By rotating my body more, I was able to generate extra power and get better contact on impact. Even though I didn’t practice my irons at all, my ball striking improved and I gained at least 10 yards on each club. This was actually a problem for me on a few holes because my distances were way off. The better striking was probably due to the improved lag. Like all training devices, it will require practice. 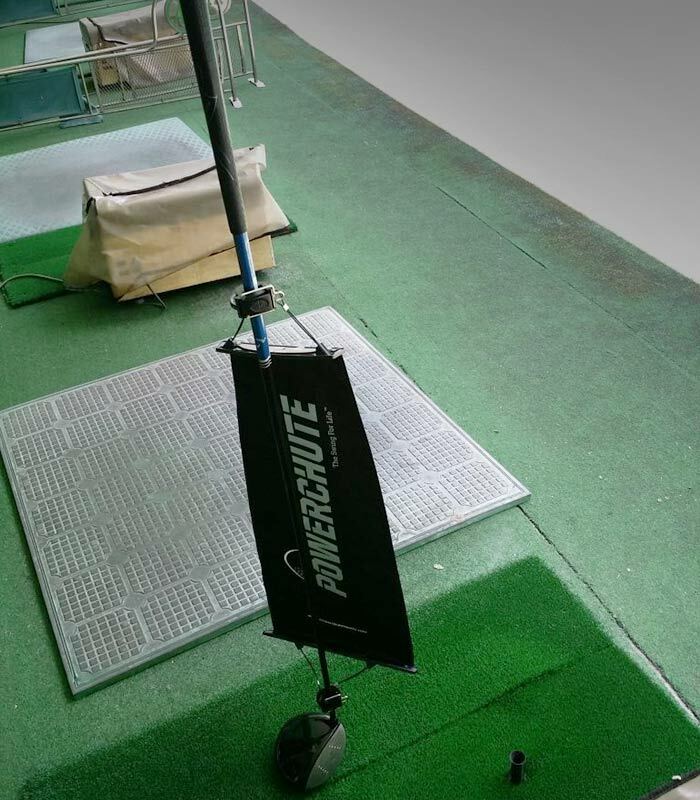 One of the big things that the Powerchute helped me do was to slow down my swing, focus on my swing path and add more lag to my swing. 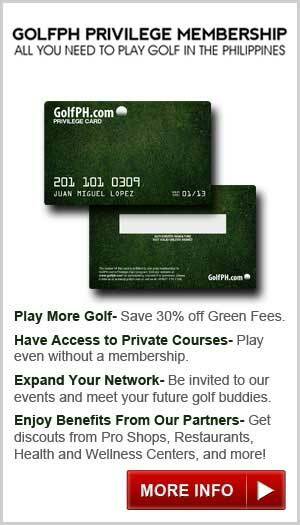 By having more lag, I am now getting better contact and hitting the ball farther. My mishits are also straighter and are less of a mishit. 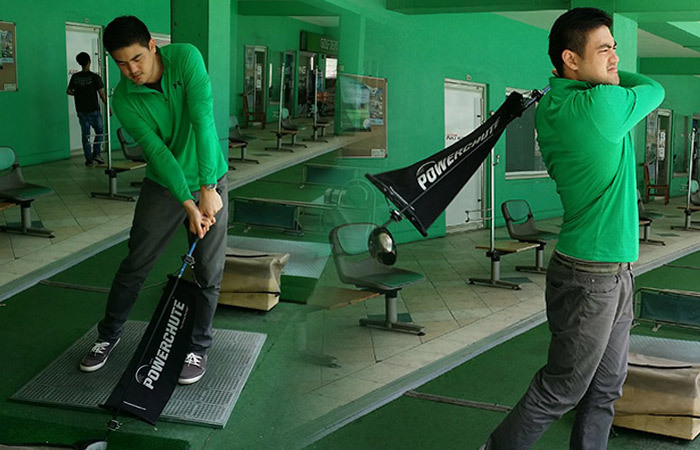 Overall, I had good results with the Powerchute swing trainer. 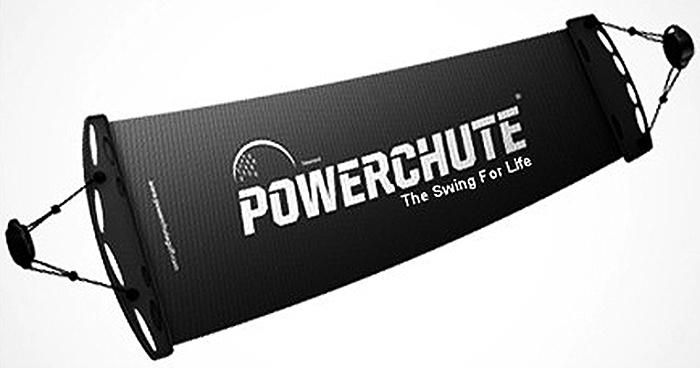 The Powerchute might not be for everyone, but for me it addressed a lot of the flaws that I had in my swing and because of that, I would recommend the Powerchute as a training aid device. My drives are still not where I want to be, but luckily for me, my office is at a driving range and ill have plenty of time to put in the work. Anyone else tried using the Powerchute? I would love to hear what type of results you guys have gotten. Feel free to leave your thoughts below.